Once you log in you can see the browser window visually separated into three functional areas. The very right vertical part is Infopanel. By default, when no files are selected, it contains Infopanel icon (letter "i" in circle) with Select all button beneath it. 1. Filename - this is the original filename of your asset. You can change it right here in Pics.io. The easiest thing to do it is to make a double click on the filename. This change will be saved in Google Drive as well after sync. Always unlock - this default status will keep your assets always open for changes. Always lock - this option will lock your assets for changes. Unlock to modify a particular asset in the preview, and the system will return to its default Locked status once the asset it closed. Unlock until logout option will keep the Infopanel unlocked for changes until the end of the session. 3. Three vertical dots to the left of the Lock sign hide a dropdown menu with three options: Download allows you to download the selected assets. Move to trash button deletes the selected assets from your Pics.io storage. And Rename button allows to change the filename of the asset. 4. Title & Description block contains two correspondent fields for you to fill in to make your assets more verbally-specified. 5. Keywords section allows you to create or modify keywords. Here you can also see a 'magic wand' sign that helps you auto-generate keywords. 6. Assignees section lets you assign the current asset to a particular teammate. 7. Linked assets block gives you information as to which other assets the current asset is associated. You can easily unlink one or several files by a simple click on the X next to the filename. 8. Collections section shows you which collections the current asset belongs to. 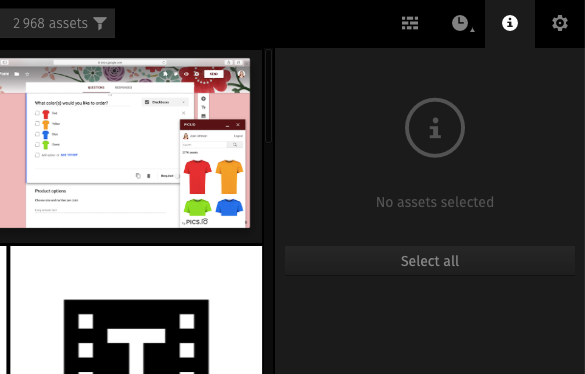 One and the same asset can belong to several collections in Pics.io. If you want to delete this asset from one collection but keep it in another collection, you just need to press X next to the name of the collection you want to remove. 9. Lightboards - this section shows if an asset belongs to any of your personal lightboards. This tag is only visible to you. A simple click on the cross next to the name of the lightboard will detach this asset from the lightboard. 10. Asset marks field allows you to star-rate, mark the revision stage or label your assets with color. Learn more about these features here. 11. Share option - switching the slider you will generate a link that you can use to share this asset outside Pics.io. 12. EXIF section contains numerous fields for you to see, add and modify specific metadata fields. NB. Please note, that this block looks different for users who got registered in Pics.io after July 2018. You can read more about metadata processing in Pics.io here. 13. Google Map - you can get a google map automatically uploaded here. Just make sure you specify the GPSLatitude and GPSLongitude in the corresponding metadata fields. You can introduce changes in the Infopanel for each file individually, or in bulk. There are several ways you can select one or more assets.